Honestly, it’s been a while since I made this recipe so I don’t really remember where I got it from. I know I cut it out of Taste of Home or Cooking Club or one of those kind of magazines. If you know where it’s from, please let me know! 1 3 oz. package cream cheese, dived into twelve cubes. 2. Combine flour, 3/4 cup sugar, baking powder, baking soda and butter together in mixer. 3. When butter is in crumbles, add strawberries, buttermilk, and eggs. 4. 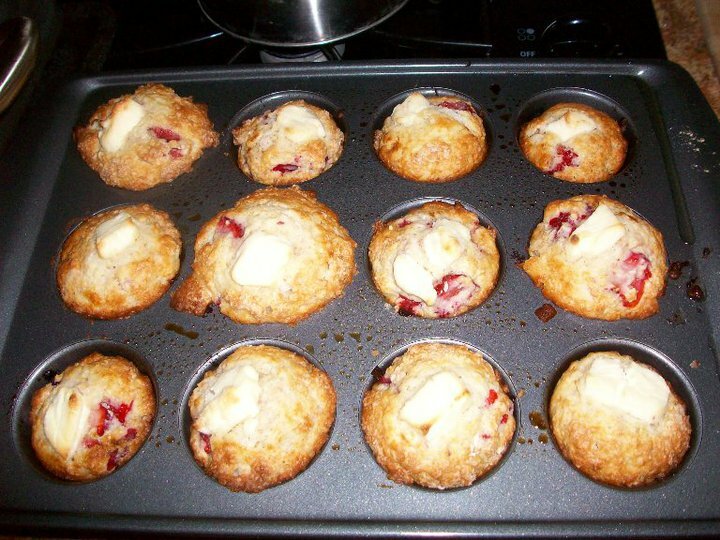 Pour mixture into greased muffin pan. 5. Dip cream cheese cubes into leftover sugar. Place one on each muffin. 6. Bake 25 minutes. Serve Warm.